From November through February, Pismo Beach, California is home to the Monarch Butterfly. The Monarch Butterflies cluster in the limbs of the Eucalyptus trees and give the appearance of yellow and orange leaves. Last year, over 80,000 spectators from around the world came to Pismo Beach to view these beautiful butterflies. The grove is staffed daily with docents and volunteers from 10 am – 4 pm. For more information, please visit www.monarchbutterfly.org. U.S stock markets are closed in anticipating of Hurricane Sandy hitting the eastern seaboard. Mortgage rates are unchanged, so we will point you to our most recent update on Thursday, October 25. With the economic news relatively quiet, we will use this opportunity to catch up on mortgage and real estate news. We have already reported on third quarter U.S. gross domestic product (GDP), which expanded at a 2.0 percent rate. Delving into that report deeper, we find that housing continues to be a boost to the economy. According to Nick Timiraos over at the Wall Street Journal’s “Developments” real estate blog, residential fixed investment accounted for 0.33 percent of GDP growth, up from 0.19% in the third quarter and 0.03 percent year-over-year. We have seen it estimated that each new house built correlates to three new jobs, so this increase is certainly a positive. The housing sector is growing stronger, but we (reluctantly) must point out a few problems that remain. Credit is tight, and the uncertainty surrounding regulation of the mortgage industry has made matters worse. A recent report by American Action Forum, a center-right think tank believes that the current regulatory environment could cause between 13 and 20 percent fewer loans originated over the coming three years. For specifics, head over to another Timiraos article at Developments. Another possible problem for the housing recovery – a glut of foreclosures. Banks have cut back on REO sales drastically. According to a recent report, distressed properties made up just 38.6 percent of sales in September – a low for the recession. Short sales have been much more common. However, we are facing an obstacles that could halt this trend: the expiration of the Mortgage Forgiveness Debt Relief Act, which gives a deduction for cancelled or reduced mortgage debt. Read more HERE. Should this tax deduction drop, we expect to see foreclosure activity increase, as homeowners cut back on short sales. There remains over $1 trillion in negative equity in home mortgages. We expect this number to slowly reduce as property values rebound and principle reductions/HARP activity increases, but we still have a long ways to go. I hope the World Series trophy stops in San Luis Obispo again this year!!! Video of Rich Ferguson scaring some folks in downtown San Luis Obispo. Shout out to two local service providers for exceptional service in an emergency situation! My kitchen faucet broke Tuesday night, to the extent that the on/off handle snapped, and we were left with two options: allow the water to run continuously or turn off the main water source to the sink. Obviously, we chose to turn off the water source. I contacted Phil Stone at Ferguson’s on Wednesday morning. He helped me select a faucet and arranged overnight shipping from their So. Cal. facility. I also notified Ken Hudgens of Hudgens Plumbing about our dilemma and he arranged to be at my house by 2:30 p.m. on Thursday to install the new faucet. It’s worth mentioning when service providers recognize a difficult situation and respond quickly. Should you find yourself needing kitchen/bath fixtures or a good plumber I highly recommend these guys! October is Breast Cancer Awareness month and PUMA Aquatics will be hosting their 5th Annual Breast Cancer Awareness Meet at Arroyo Grande High School this weekend. 360 swimmers from Central and Southern California will be swimming to benefit our community. Over the past 4 years, $40,000 has been donated to the Hearst Cancer Resource Center, which offers free cancer support and services to patients and their families on the Central Coast. This is a wonderful chance to celebrate the great sport of swimming and help our community! Shibui (shi-BOO-ee): The subtle beauty of aging. Source: Japanese. It is believed that half the languages spoken on our planet will be extinct by 2100. When a language dies, we lose more than a point of view; we lose traditions that connect people to place – and to each other. We lose deep cultural wisdom: things like myths and fairy tales, knowledge of plants and animals, humor, prayers, and recipes. On the market: shared living space with six-month lease. No rent, but must work for room and board; no pets; weekends off (kind of); transportation provided; astronomical view. What a deal! Where do I sign? Oh, did I mention there is an almost-four-year training program? Still, it would be my chance to live aboard the international space station. Hmmm. I would have to learn Russian and spend half of my life training in Star City (outside of Moscow) a month at a time over the next several years. But eventually I would have the run of the station and a perch to observe the Earth like no other. After two days of contemplation, I accepted. 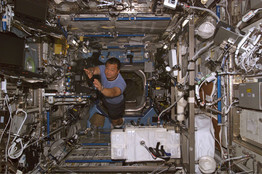 NASA Leroy Chiao left Earth on Oct. 9, 2004, for the International Space Station, where he lived for six months. I left Earth on Oct. 9, 2004, for my new home in space. There are several rooms (modules), two airlocks (one American, one Russian), one toilet, a separate washroom, plus a powder room in the Soyuz spacecraft. There is not so much a kitchen, but more of a dining room with what could be considered a kitchenette. The place comes equipped with a gym, complete with a treadmill—and harnesses and rubber bungees to hold one down on the track. Don’t like running? There is also a stationary bicycle, and a resistance-exercise device to keep up muscle tone and bone density in zero gravity. The station is quite roomy, actually, even though my own quarters were about the size of a phone booth. When I was there, the place felt like a good-size three-bedroom apartment. There was plenty of room for a crew of two, plus three visitors during crew exchanges. 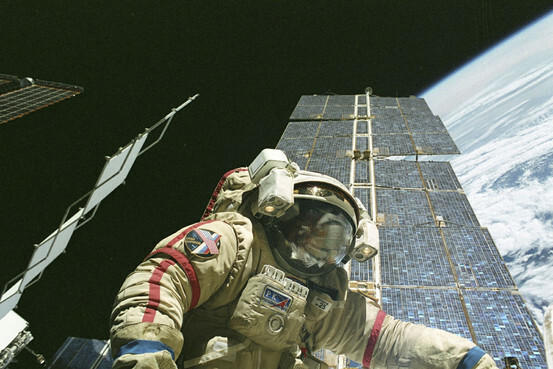 In space, there is no up or down, so there is no floor or ceiling. Thus, there is twice the amount of wall space available, and the lack of gravity makes the volume much more usable. 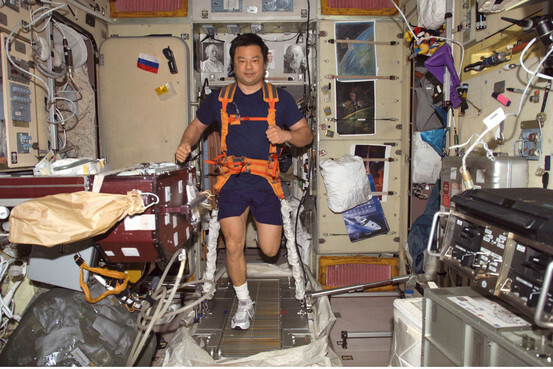 NASA Astronauts had to strap themselves down in order to run on the treadmill in zero gravity. Most of the work is housekeeping and repairs, just like at home on Earth. Something always is in need of maintenance. However, the main purpose of the space station is to be the worlds’ premier microgravity research platform, and the most rewarding work is conducting scientific investigations. Location, location, location! That’s what all real-estate people tell me. And, low Earth orbit is no exception. The view is unparalleled. From 250 miles up, one can see everything from cities, mountains, lakes, rivers and various landmarks, to rain forests, bridges, volcanoes and other natural wonders. Of course, it is difficult to go for a stroll around the block. Several days of planning and preparation are required for even a short excursion. And, what about taking the spacecraft for a drive? That also takes preparation and a full day—even just to move from one parking spot to another. Thus, the vehicle is usually used only for arriving to, and departing from, the domicile (once for each). NASA From 250 miles up, one can see everything from cities, mountains, lakes, rivers and various landmarks, to rain forests, bridges, volcanoes and other natural wonders. This is the age of well-sealed green homes, and the space station is no exception. The air is purified using filters, micro-impurity reactors and carbon-dioxide scrubbers. The water is similarly run through resin-exchange bed purifiers. When I was there, perspiration and other condensation were collected and purified for drinking. Other wastewater is also recycled (you know what I mean). And all power aboard the station comes from solar panels. Don’t want to rent? Do you prefer to buy? 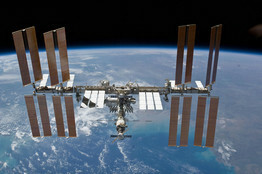 The construction cost of ISS is around $2.5 billion. You’ll have to ask your real-estate agent for comps. I don’t know if the market in low Earth orbit has gone up or down. There are others who are offering new construction, but they are not experienced builders. I recommend going with the guys who have done it. For less, one can visit for a week or so at a time. Several individuals have, and all have loved the experience. The ISS is the ultimate destination. Like all desirable real estate, it’s not cheap. It is, however, an experience you would never forget. 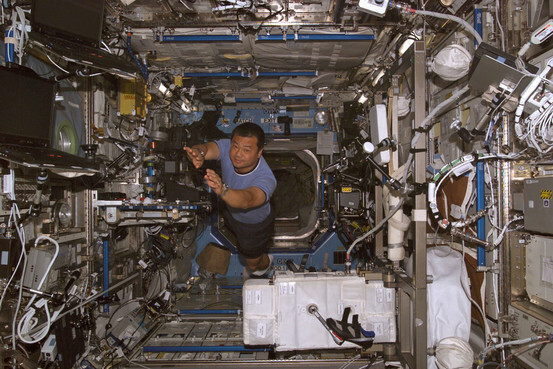 —Leroy Chiao, who has spent more than 229 days in space, now serves as an adviser for human spaceflight for the Space Foundation. He lives in Houston. • There are 13 connected modules, making it about the size of a U.S. football field, including the end zones. Living space is 13,696 cubic feet. • Six crew quarters, each about the size of a phone booth. To enter, the space is unzipped; the crew member then straps himself into a sleeping bag. • For exercise, there is a Russian treadmill, an American treadmill, a stationary bike and a resistance machine, all spread throughout the station. • There is a galley area, but it looks more like a science station than a kitchen. • Wi-Fi Internet access throughout; movies can be watched on laptops. • 205 people have lived in it. A version of this article appeared October 19, 2012, on page M7 in the U.S. edition of The Wall Street Journal, with the headline: At Home 250 Miles Above Earth.